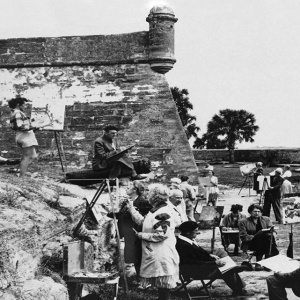 On a cold night in January 1924, a handful of artists and writers gathered around the fireplace in the historic Fatio House to form an art group that would become known as the St. Augustine Art Association. Identified early on as the Galleon Club, a reference to the town’s Spanish heritage and symbol of discovery, these visionaries hoped to create an environment that would encourage artists of all genres to participate in the expressive arts. Who could have imagined their humble beginnings would grow into a world-class destination for fine artists with the St. Augustine Art Association at its cultural epicenter? This season, the St. Augustine Art Association celebrates its 95th Anniversary with an array of art happenings at the Art Center and around town.